Automated functional testing can be useful when used in conjunction with manual functional testing. But contrary to popular beliefs, it has limited use and requires significant investment. In my 18 years as a tester, I’ve rarely run into a project which relies on automated functional testing as the main form of testing. But that’s in the past. 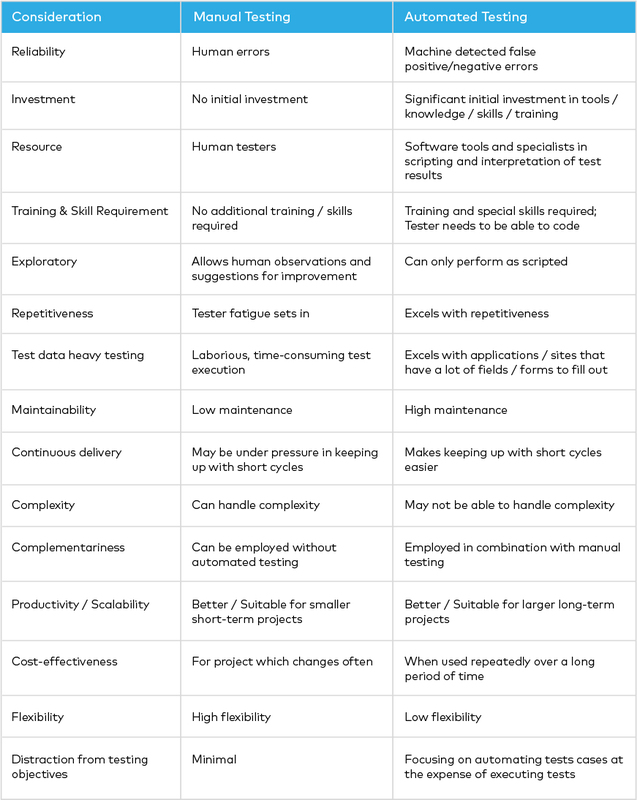 With agile projects on the rise, the future of testing could be very different. It takes commitment and investment from the whole organization to adopt automated functional testing successfully, but when done right, it can transform your testing processes and improve quality, productivity, employee job satisfaction, and ROI. Executing software tests can be tedious, repetitive and time-consuming when done by a human, hence the quest for automation. Automation also promises shorter turnaround time, less tester fatigue, and decreased human error. Once automated tests have been successfully set up, they can be run quickly and repeatedly. In situations where testing can be either manual or automated, automated testing can be more effective than manual testing in detecting certain classes of defects. Before we go any further, let’s look at the kind of testing we’re talking about. Quality is the responsibility of the whole delivery team. Software that passes testing gives a certain degree of assurance on quality. Testing should happen at all levels and stages throughout the delivery process. 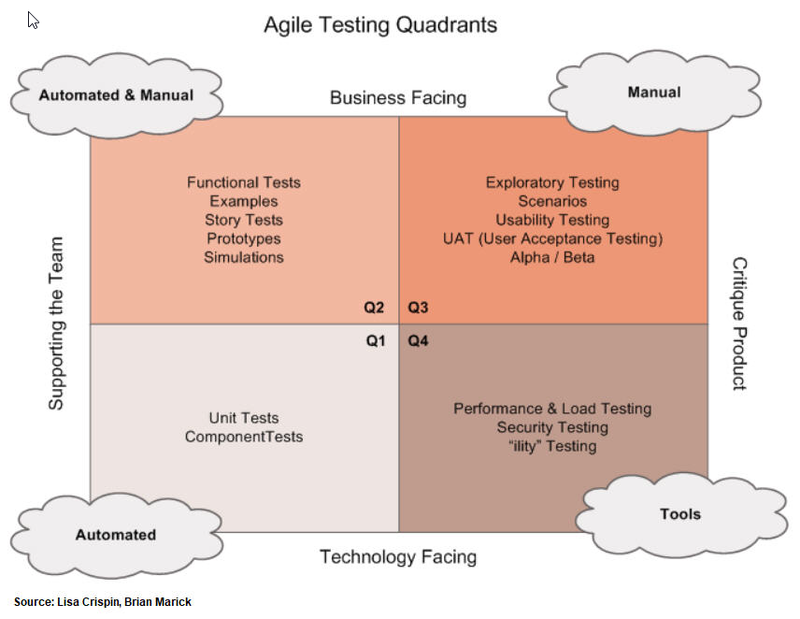 When we look at the Agile Testing Quadrants above, we see that test automation can happen in Q1, Q2, and Q4. For activities in Q1, such as unit tests and code coverage in test-driven development, testing at the unit and integration levels can be automated using API-based tools. For activities in Q2, typically functional tests, testing at the system level can either be manual or automated using GUI-based tools. For activities in Q4, such as performance and load testing, there is simply no viable manual alternative. 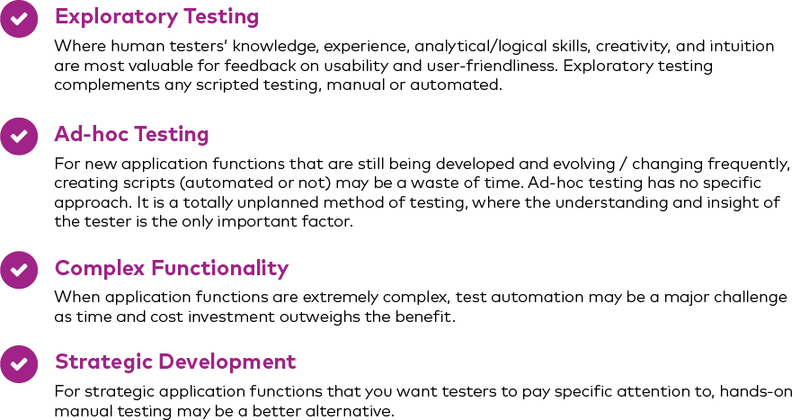 Faced with the manual vs. automated alternatives, test automation considerations and decisions are usually circled around functional testing. The rest of this article will focus mainly on functional testing. Manual vs. Automated Testing: Where Do They Shine? This chart shows the results of a German survey conducted in 2011. It shows, among other things, that test automation in that country was still little used in system and acceptance tests (where functional testing lies). This survey result lines up with the often-quoted worldwide industry survey result that 70-75% of all functional testing is still done manually. But why? There are a number of reasons QA organizations or testing teams may not use automated testing. They may feel it’s unnecessary – that they can handle it all manually. This is especially true when the majority of projects are small and short-term, thus not suitable for automated testing. Another common reason is that they may not have the time and resources to investigate alternatives to manual testing; invest in automation tools; learn how to build and maintain scripts. It’s a reality that automated testing requires a significant financial investment that many organizations just may not have. For those who have access to testing automation tools (such as Selenium, TestingWhiz, HP – UFT, TestComplete, Ranorex), certain applications may be too complex and not suitable for automated testing. So, when does it make the most sense to do manual testing? Automated testing shines in situations where testing tasks are repetitive and relatively unchanging from one test cycle to the next. To achieve goals and execute strategy, the key individual needs to be identified to lead the adoption of automated testing in your organization. This person is a TAE (Test Automation Engineer) or a TAA (Test Automation Architect). They need to have skills, experience, and expertise in software engineering. Furthermore, the TAE/TAA needs to be aware of industry coding and documentation standards and best practices to make use of them when developing a TAS (Test Automation Solution) and the automation framework. This person should know how to code and is the main resource in developing and maintaining scripts. This skill set is more likely to come out of development teams. Testers can collaborate with the TAE in setting up and executing the automation scripts. Team members should be trained so that they can at least write a simple script, run tests, and analyze the results. TAE/TAA can handle more complex tasks of writing frameworks, designing automation architecture and mentoring other team members. Each organization will have different needs and resources to support test tools. Organizations use a variety of testing tools, including those from commercial vendors, open source, and in-house developed. Commercial vendors typically provide for paid support, and in the case of the market leaders, usually have an eco-system of experts who can assist with test tool implementation. Open source tools may offer support such as online forums from which users can get information and post questions. In-house developed test tools rely on existing staff to provide support. Organizations could acquire a single tool that supports all technologies used in their applications or separate tools for each technology. For example, one can use Selenium for web applications, Robotium for Android applications and MS Coded UI for desktop applications. What to automate, when to automate, or even if automation is really needed are crucial decisions that every delivery team must make. Regression testing is the prime candidate for automation. Yet the test automation decision still depends on the maturity of the system under test (SUT). Is this a large data input? Does it require constant human intervention? Does it involve 3rd party system? Are the test results unpredictable? How often will the functionality change? Before the benefits of automated testing can be enjoyed, organizations have to invest a significant amount of financial and human resources. A formal cost-benefit analysis may be required to help with that decision. The organization as a whole has to be convinced test automation is worth the investment. As a Quality Assurance Tester at T4G, Bong is a team-player who focuses on quality management and improvements in the delivery of solutions. When he’s not thinking about issues and integrity, he works on and acts out the other tasks in his personal mission statement.